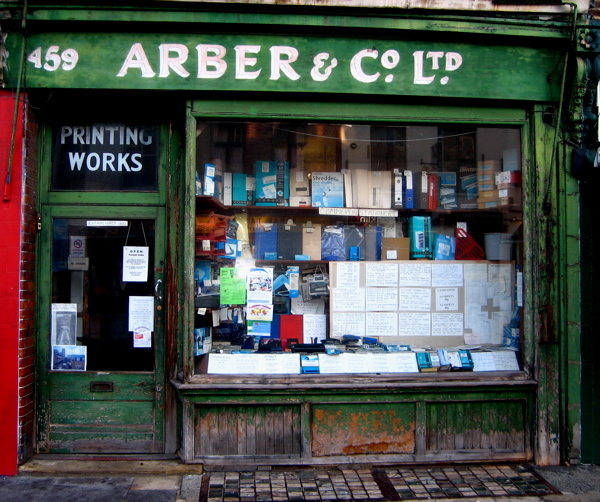 There have been changes at W.F.Arber & Co Ltd (the printing works opened by Gary Arber’s grandfather in 1897 in the Roman Rd) since I was last here in February. At that time, Gary was repairing the sash windows on the upper floors, replacing rotten timber and reassembling the frames with superlative skill. This Spring, Gary was the recipient of a small grant from the Olympic fund for the refurbishment of his shop front, which had not seen a lick of new paint since Gary last painted it in 1965. The contractors were responsible for the fresh coat of green but Gary climbed up a ladder and repainted the elegant lettering himself with a fine brush, delicately tracing the outline of the letters from the originals, just visible through the new paint. This was exactly what he did once before, in 1965, tracing the lettering from its first incarnation in 1947, when the frontage was spruced up to repair damage sustained during the war. No doubt the Olympic committee can sleep peacefully in their beds now, confident that the reputation of our nation will not be brought down by shabby paintwork on the front of W.F.Arber’s Printing Shop, glimpsed by international athletes making their way along the Roman Rd to compete in the Olympics at Stratford in 2012. Equally, Gary is happy with his nifty new paint job and so all parties are pleased with this textbook example of the fulfilment of the ambitious rhetoric of regeneration in East London which the Olympics promises. If you look closely, you will see that the glass bricks in the pavement have been concreted over. When Gary found they were cracking and there was a risk of some passerby falling eight feet down into the subterranean printing works, he obtained quotes from builders to repair them. Unwilling to pay the price of over five thousand pounds suggested – with astounding initiative, Gary did the work himself. He set up a concrete mixer in the basement printing shop, filled the void beneath the glass bricks with rubble, constructed a new wall between the building and the street, and carried all the materials down the narrow wooden cellar stairs in a bucket, alone. Gary’s accomplishments fill me with awe, for his enterprising nature, undaunted resilience and repertoire of skills. These thoughts of mortality were a sombre counterpoint to the benign season of the year. Leading Gary to recall the happy day his father and grandfather walked out of the printing works at dawn one Summer’s morning and, in their enthusiasm for walking, did not stop until they got to Brighton where they caught the train home, having walked sixty miles in approximately twelve hours. In those days, Gary’s uncles Len and Albert, worked alongside Gary’s father and grandfather here in the print shop, when it was a going concern with six printing presses operating at once. Albert was an auxiliary reserve fireman who was killed in the London blitz and never lived to see his baby daughter born. Gary told me how Albert worked as a printer by day and as a fireman every night, until he was buried hastily in the City of London in an eight person grave. “I don’t know when he slept!” added Gary contemplatively. There was no trace of the grave when Gary went back to look for it, but now Albert is commemorated by a plaque at the corner of Althelstan Grove and St Stephen’s Rd. Whenever I have the privilege of speaking with Gary, his conversation always spirals off in fascinating tangents that colour my experience of contemporary life, proposing a broad new perspective upon the petty obsessions of the day. My sense of proportion is restored. This is why I find it such a consolation to come here, and leads me to understand why Gary never wants to retire. Each of Gary’s resonant tales serve to explain why this printing shop is special, as the location of so much family and professional life, connected intimately to the great events of history, all of which remains present for Gary in this charmed location. Now that Gary is a sole operator, with only one press functional, he is scaling back the printing operations. And I joined him as he was taking down the printing samples from the wall where they have been for over half a century, since somebody pasted them onto some cheap paper as a temporary measure. It was the scrutiny of these printing specimens that occasioned the reminiscences outlined above. 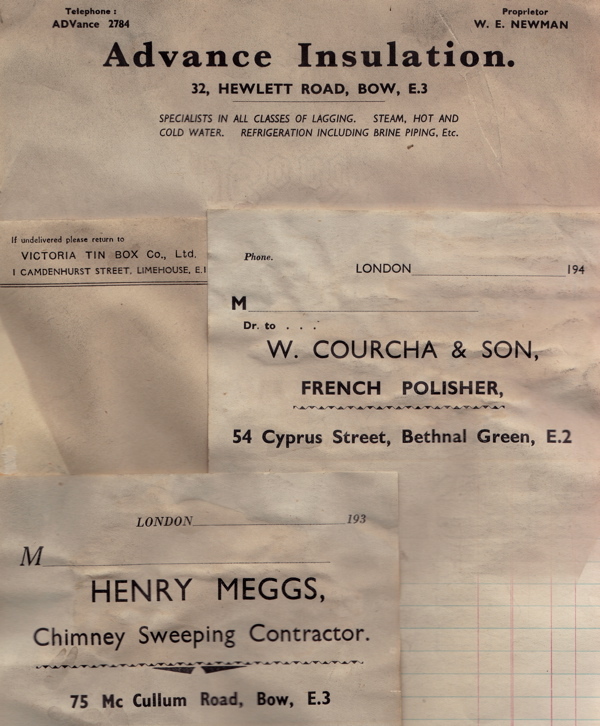 Although these few samples comprise the only archive of Arber’s printing works, yet even these modest scraps of paper have stories to tell, of businesses long gone, because Gary remembers many of the proprietors vividly as his erstwhile customers. 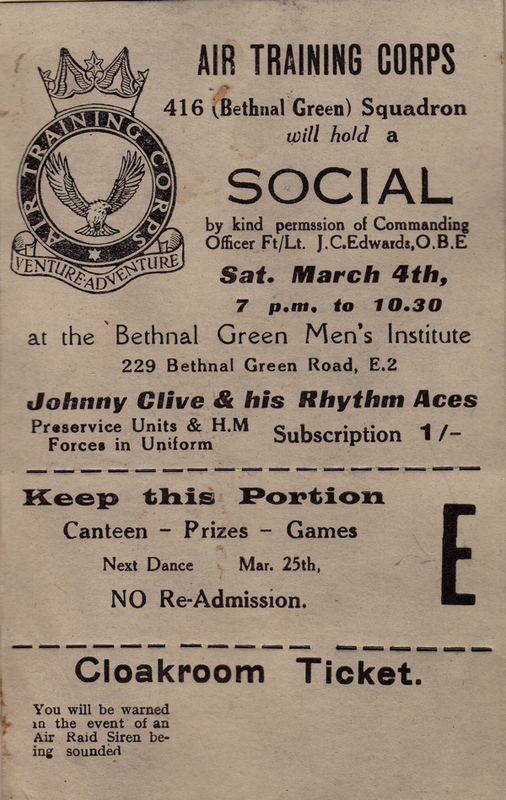 I was fascinated by the letters ADV, indicating the Bethnal Green exchange, which prefix the telephone numbers on many of these papers. 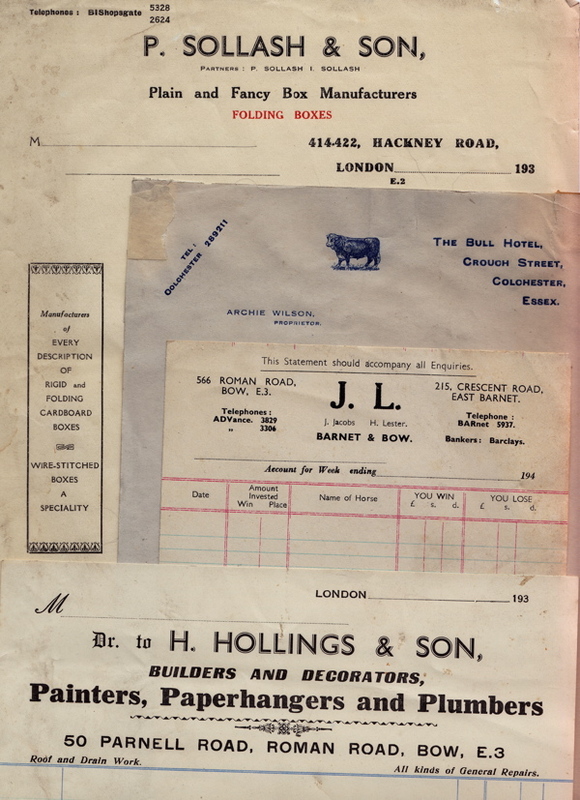 Gary explained this was created when smart people who lived in the big houses in Bow Rd objected to having BET for Bethnal Green, which they thought was rather lower class, on their notepaper. There were letters to the Times and a standoff with the Post Office, until the local schoolmaster worked out that dialling BET was the same as dialling ADV – which might be taken to stand for ‘advance’ indicating a widely-held optimistic belief in progress, which everyone could embrace. So just like Gary’s Olympic paint job, all parties were satisfied and looked to the future with hope. Yet more wonderful stories from Mr. Arber! He seems to inspire you, gentle author. Brilliant. Love reading about Gary. Looking at old examples of the familys’ printing is so interesting and takes me back to the 50s when we always had similar receipts . What a delight to find a bit of family history, Harry Osborne was the brother of my grandfather Charles. My mother has a leaflet framed and hanging in her kitchen from one of the butchers shops (it was described as a pork butchers on Roman road although a different number. This is one of the only things that links her with her past as very little information was passed down. She remember visiting a butchers shop on one of her trips in from Colchester in the forties, when visiting her Uncle Bill and Aunt Rene and she remembers a young man called Lenny. I have been trying to research the Osborne family for some time, I know the names of the brothers and the old grandfather and little bits and pieces but cant find out when they arrived from Germany. Do you think there is anyone left to cast any light on my past!!!!! Im so delighted in finding something. This is a reply to Sandra. My Great Grandfather was Harry who owned the shop and Lenny is my mums dad!!! I would love to hear from you. My email is ssheppy@btinternet.com. I do not know what Harry’s German name is tryin to find out if anyone knows anything about these people please let me know. I used to live “dahn the Roman” (well, Lichfield Rd) and loved going in to talk to Gary. He showed me how the Pankhurst press worked. Anyone know if he’s still, erm, with us? BTW I went to the butchers a few doors down and, viewing the array of meat slightly doubtfully, asked in terribleh middle-class tones if they had any free-range chicken. The bloke in the stained white coat looked at me, then pointed to a chicken breast. “That one,” he said “had a view out the window…”. Katy, I can reassure you, Gary is alive and kicking! Fantastic stuff. I took some photos of the shop pre-paint job in October 2008. Sarah we havnt been able to make contact and share information. 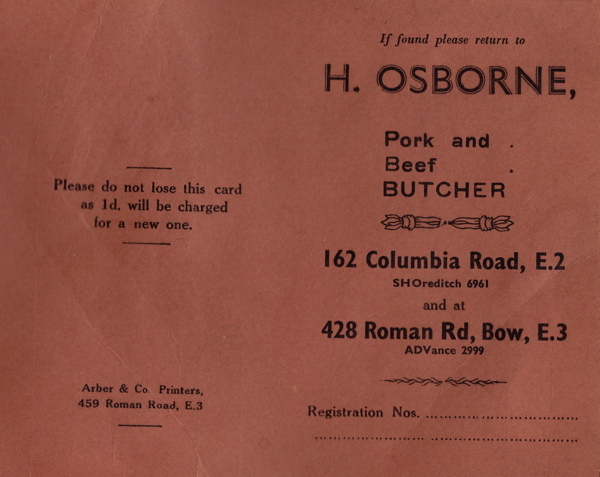 If anyone else out there knows anything of the Osborne butchers history photos anything . thanks to the gentle author I had a nice and interesting morning a couple of weeks ago.getting the tube to Bethnal green I walked up roman road till I found Mr Arber’s premises. Owning a small Adana press myself I found the article of great interest. 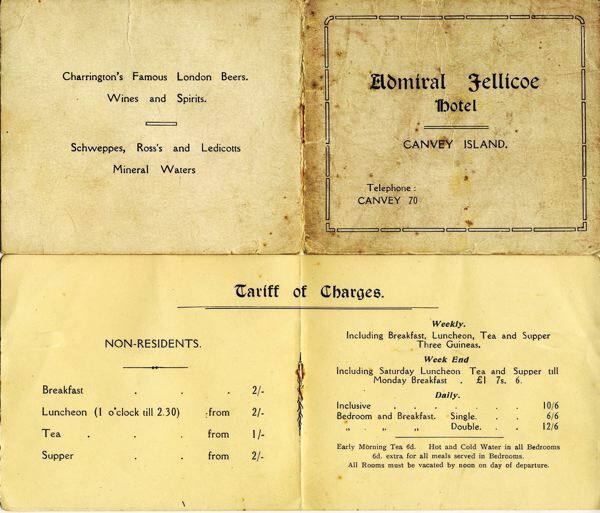 Mr Arber made me most welcome and after a small purchase he showed me the cellar with his presses therein……..He has such a way with his tales of jobs done, person’s met that I left knowing I’d met a real nice gentleman. 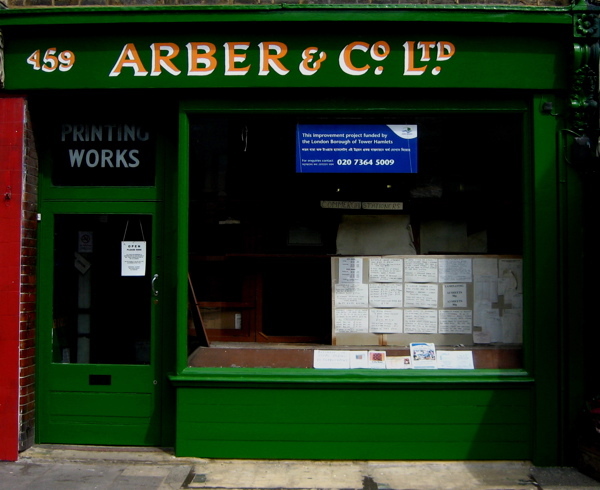 He says letterpress will make a come back, I think so too, its ”proper” printing……….best wishes Mr Arber!!! !